Most holy Apostle, St. Jude, faithful servant and friend of Jesus, the Church honors and invokes you universally, as the patron of difficult cases, of things almost despaired of, Pray for me, I am so helpless and alone. Intercede with God for me that He bring visible and speedy help where help is almost despaired of. Come to my assistance in this great need that I may receive the consolation and help of heaven in all my necessities, tribulations, and sufferings, particularly - (make your request here) - and that I may praise God with you and all the saints forever. 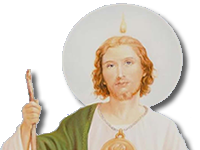 I promise, O Blessed St. Jude, to be ever mindful of this great favor granted me by God and to always honor you as my special and powerful patron, and to gratefully encourage devotion to you.